I like French Films! Pretentious Boring French Films! I therefore officially take credit for MONSIEUR HIRE’s coming out on North American DVD in November, which I had long been waiting for because it was the first foreign film I saw more than once in a theater. I bought it first day it was available and watched it a couple of weeks later. I remember being utterly beguiled back in 1990 by the notion that a snooty subtitled movie in an incomprehensible language could be such an accessible, watchable, tense thriller. So tense indeed, that it gave me an entirely pleasurable lesson as a young cinephile about patience (it obviously wasn’t a thrill-ride like THE TERMINATOR). But I hadn’t seen HIRE for more than a decade but, I found, it stood up, as good as ever (and Leconte has never since come close to it). The comparisons with Hitchcock and REAR WINDOW were obvious (both movies center on a man who looks out a window and witnesses a crime, though Hire is a suspect while LB Jeffries is not), but HIRE didn’t suffer by the comparison, rather it was enriched by it. Indeed, to use the REAR WINDOW template, HIRE begins (so to speak, not literally) with the shot when Thorvald breaks the 4th wall and looks at Jeff/the audience. This is one of the most unsettling moments in movie history, but HIRE takes it for granted. WINDOW is about voyeurism against someone unwitting; HIRE is the post-modern remake, about voyeurism on someone who knows, and Sandrine Bonnaire knows how to play up her beauty without coming across slutty or affected. ITEM! I hope to get more results from recommending another French movie from the early 90s that I fear may go down the memory hole. Back in 1991, I saw this twisted, black semi-comedy three times in theaters and it topped my Ten Best list. I have never even seen it crop up on TV since, and it was only released on North American DVD this past summer (with a very misleading box … this picture I put up here is the theatrical poster from back then). None of the principal name credits at the IMDb page here meant anything to me. Director Jerome Boivin has worked near-exclusively on French TV since. And the lead “actor” has had a hard time getting roles since … because he is a dog. 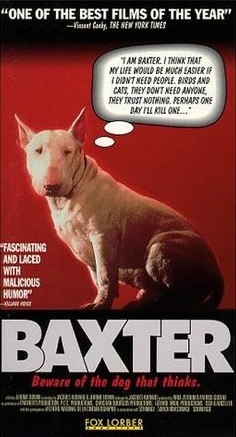 C’est BAXTER … mefiez-vous du chien qui pense.